Want to know how to delete photos from iPhone 8/X? Follow this guide to grab practical ways to easily remove singular photo, multiple photos, and all pictures, from new iPhone 8/X. AnyTrans provide you with easy ways to manage your iPhone photos, transferring, removing, etc. As well as support other kind of data, contacts, messages, music, videos, etc. In the last daily tip, we have mentioned 11 tips to make your iPhone 8/X run faster. And one way of them is removing the unimportant and useless pictures on your iPhone 8/X. Truly, too many photos saved on iPhone 8/X will eat up too much storage space, and consequently cause iPhone running extremely slowly. Since in the tip we just have briefly said several words about it, so in this guide, we will show you how to delete photos from iPhone 8/X all-sidedly, singularly, multiply, and all pictures removing. Keep reading and find how. Step 1. Open Photos app on iPhone 8/X. Step 2. Tap the photo you plan to remove in Camera Roll. Step 3. Tap the trash icon to simply delete it. Step 2. Tap Camera Roll. Step 4. Tap each photo or video that you want to delete. Step 5. Tap the trash icon at the right corner > Delete Photos. 1. In Method 1 & 2, the deleted photos will not be immediately gone forever, but stay in the Recently Deleted album. 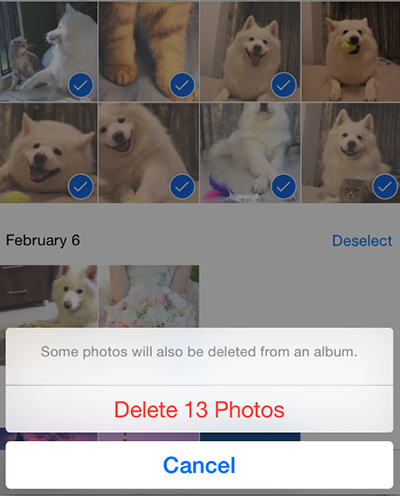 In 30 days, you can go to Recently Deleted album to get them back, if you mistakenly remove some, or permanently delete these pictures, by Recently Deleted album > Select > Tap Recover, or Delete. 2. If your plan is to remove all pictures on iPhone 8/X with large amount, like hundreds of pictures, obviously Methods 1 & 2 seem tedious. So we recommend you moving to Method 3 to get the solution. 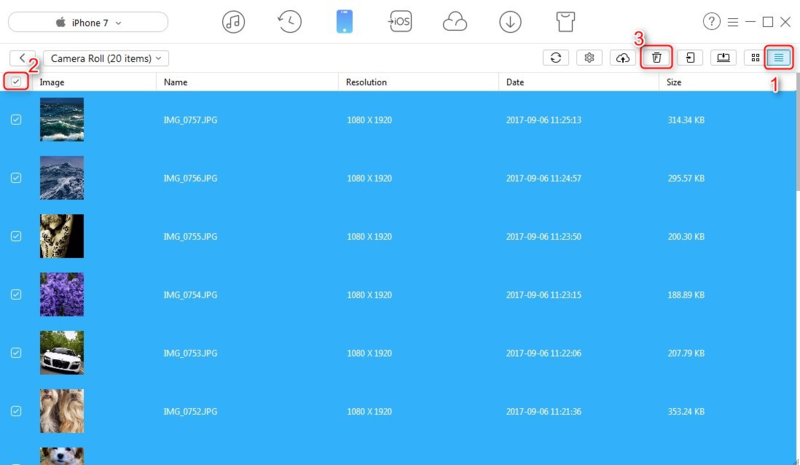 If there are hundreds and thousands of pictures on your iPhone 8/X, and you are planning to remove them all, this part would perfectly work for you. In this part, we provide two ways to help you, and choose the one that suits you. 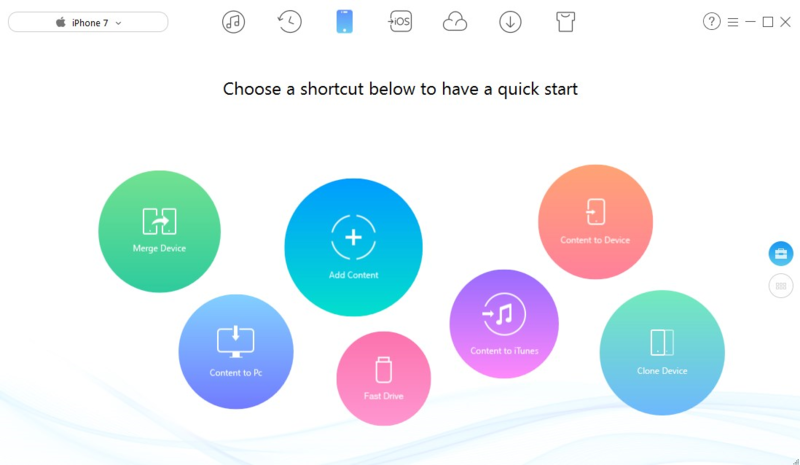 Before taking this method, firstly you need to learn that Resetting function will remove not only photos on iPhone 8/X, but all other contents and settings, such as contacts, messages, music, videos, etc. The most serious issue is that those deleted contents and settings are irretrievable. To be honest, this is not a wise choice. So we recommend you to apply the second way below for a better choice to delete all photos on iPhone 8/X. Step 1. On your iPhone 8/X, go to Settings. Step 3. Scroll down to bottom, find Reset, and choose it. Step 4. Then tap Erase All Content and Settings. Step 5. Enter the passcode to erase your iPhone 8/X. Taking this way, we need get help from one professional iOS data managing application - AnyTrans. As an iOS data manager, AnyTrans is a great helper to put your all iPhone data just in the right place you want. 1. For iPhone 8/X pictures, AnyTrans enables you to transfer them to another iDevice, iTunes, iCloud, or your computer; Surely you can also just remove them from iPhone 8/X, with it. Although we list this it in the deleting-all-pictures part, it also achieve singular, multiple photos removing mission. So it is the 3-in-1 way. 2. Not just photo managing, all other kinds of data types are also included, contacts, messages, music, videos, notes, etc. So why not free download it now for a trial now, before we get into the detailed steps to delete photos from iPhone 8/X with AnyTrans easily? Step 1. Open AnyTrans on your PC, or Mac > Connect iPhone 8/X to it. Step 2. Scroll down to the next page > Click Photos box > Open Camera Roll. Step 3. In the Camera Roll album, you can preview and select the photos you want to delete > Then click on the trash icon on the right hand corner. 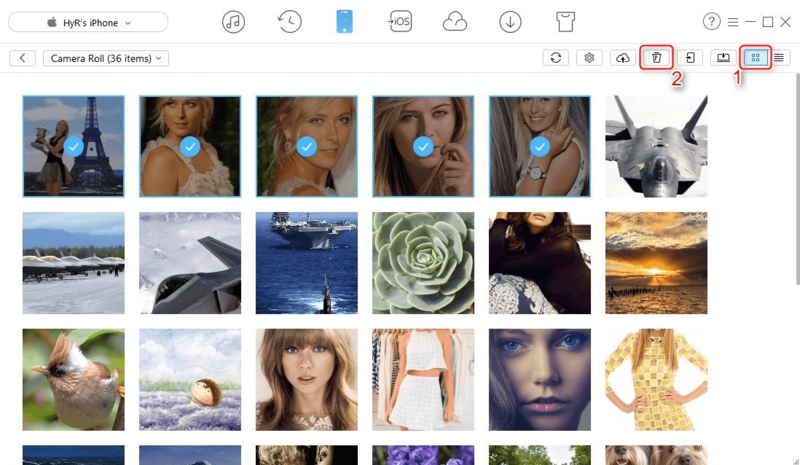 Note: You can Ctrl + click the photos to select multiple photos, or Ctrl + A to select all photos to delete. Step 4. 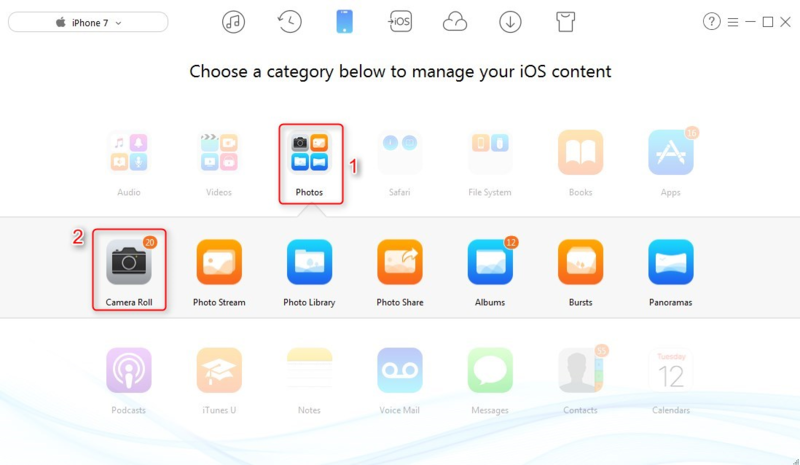 To delete all Photos on your iPhone, you can also switch to the display mode on the right hand, and select the check box on the top left-hand, then click the trash icon on the upper right corner. By comparison, no matter what your plan is, deleting singular photo, or multiple ones, or removing all pictures from iPhone 8/X, AnyTrans can meet all your demands. So why not try it now?